Maharashtra Chief Minister Ashok Chavan and Protocol Minister Suresh Shetty would receive United States President Barack Obama as the state representatives along with Union Minister Salman Khurshid. "The Ministry of External Affairs has told us that the chief minister and the protocol minister would receive Obama on his arrival at the Chhatrapati Shivaji international airport on November 6," an official from the chief minister's office told PTI. The Indian and American ambassadors, the state protocol officials and American consulate general would also accompany the Chavan, the official said. Chavan has also received an invitation from American officials to attend the president's afternoon function at the Taj hotel on anti-terrorism and evening function at the Trident hotel. "It is upto the chief minister to decide which programme he will attend. 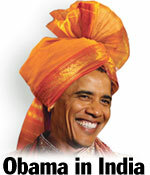 However, Chavan's one-to-one meeting with Obama has not been fixed yet," the official said. Chavan's request to meet Obama was turned down by US officials saying that several other chief ministers were also seeking an appointment with Obama. Chavan left for his home town Nanded on Wednesday to celebrate Diwali and would return to the city on November 6. Meanwhile, Deputy Chief Minister Chhagan Bhujbal and Home Minister R R Patil have also received an invitation to attend the President's programme at the Taj.